In which we look in a little more detail at the works of Joseph Backler Snr, apparently in his heyday from about 1813 to the mid 1820s, after which his name recedes into history and his fortunes appear to plummet, for a variety of reasons which will become more clear when we look in the next blog at events unfolding around his wayward son, Joseph Backler Jr. Praise indeed! 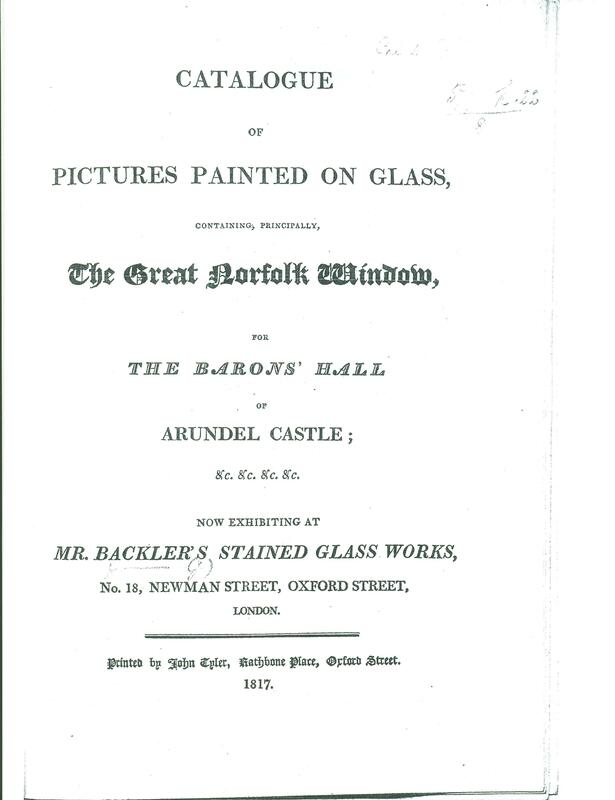 The catalogue for this exhibition listed a number of works, principally featuring the ‘Great Norfolk Window’ – King John signing Magna Carta – to be placed in the Baron’s Hall of Arundel Castle, commissioned by the Duke of Norfolk. Alas, this along with most other Backler windows, no longer exists. Some idea of the look of the window can be seen from the image on the right. (credit:ancestryimages.com). 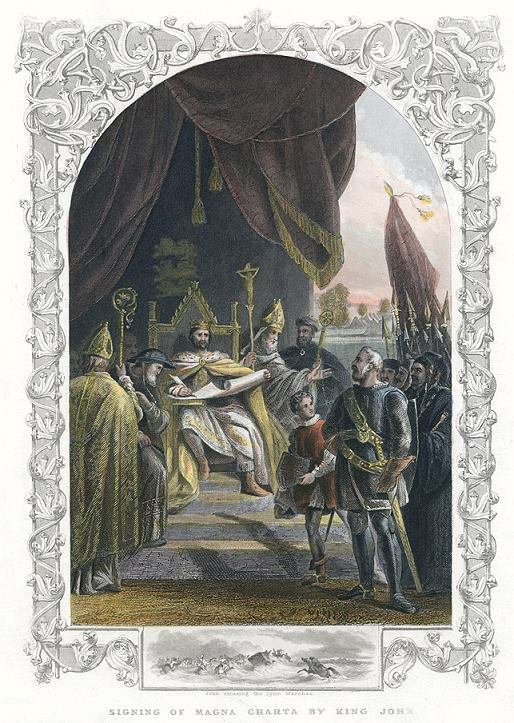 It depicts ‘Signing of the Magna Carta by King John’, anonymous engraver after a picture by Lonsdale from a painting by Backler, published in James Barclay’s Complete and Universal Dictionary … about 1850. Limehouse Church (described in ‘The Examiner’, Sunday 19 December, 1813), like many others of Backler’s windows, based on a painting by Benjamin West, who lived near to Backler in Newman Street. 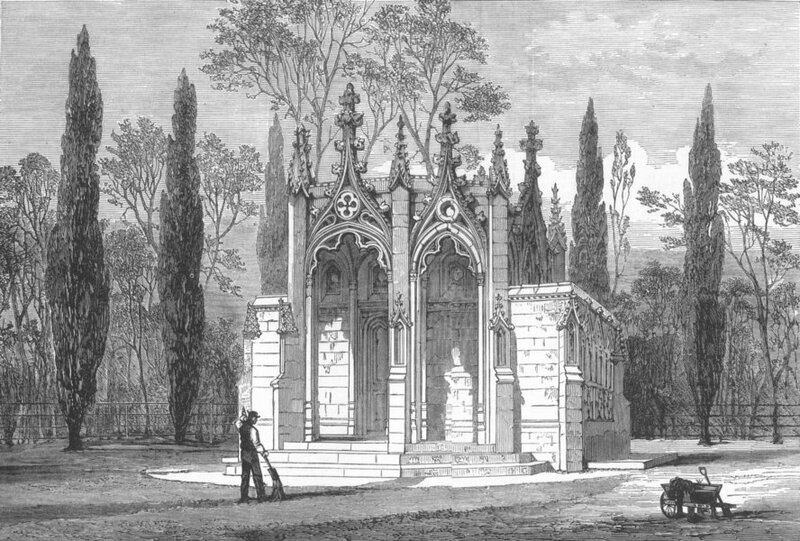 Mausoleum, Claremont: On 11 June 1818, The Times reported that His Royal Highness the Prince Leopold went ‘by appointment’ to Mr. Backler’s premises at 18 Newman Street, remaining for an hour, to ‘make suitable arrangements for the stained glass intended to be placed in the Mausoleum, which has been erected at Claremont, with much taste, in Gothic architecture, by Mr Hiort, under the immediate direction of his Royal Highness, to be devoted to the memory of our late much lamented Princess [Charlotte of Wales, 1796-1817, who died after giving birth to a stillborn son, leaving her husband distraught after fewer than two years of married life]. The whole of the windows are to be filled with the armorial bearings of Her Royal Highness, in conjunction with those of Prince Leopold’s.’ The windows were advertised for viewing in April 1819. The image is of the Mausoleum, which was converted from a summer house, and demolished in the 1920s. On 24 April 1819, a report in The Times wrote of a private viewing, that Mr. Backler’s productions ‘unite the greatest riches and variety of ornament with great breadth and simplicity of effect. The arms on the mausoleum windows are painted with exquisite richness and brilliancy…’ In July 1819, Prince Leopold and the Duke and Duchess of Kent visited Mr Backler’s studios to view the windows, which were also seen by the Duke and Duchess of York. Perhaps somewhere, in some archives, there hides an image of these windows? St Thomas’ Church, Dudley (1821, east window – this window has been seen by my distant Backler cousin from Australia, but I have not made the journey to see it – on my do-do list! ); at this time Backler also advertised viewings for altar windows ‘for the churches of .. Southwell, and Macclesfield‘. I have not been able to identify which churches these were for. 25 Feb 1823: Further advance of £50 0 0 if sufficient in the bank [p. 203]. 10 Nov 1825: £235 4 6 still due to the bankers exclusive of interest. New dignitaries to be approached for subscriptions [p. 230]. In 1810 several ‘respectable’ inhabitants suggested that the east window should be filled with painted or stained glass. The vestry did not object, provided it was paid for by voluntary subscription, but only sufficient funds to pay for the upper part of the window were promised. The subject chosen was the ‘whole History of the Transfiguration’, and in 1813 Joseph Backler agreed to execute the work and fix ground glass in the lower part of the window for a sum of not more than £1250, or to complete the whole window for £2000, subject to the satisfaction of Benjamin West and Thomas Hardwick. Here we will leave Joseph Backler Snr, tracing his later years in the next blog, which introduces his son Joseph Jnr. I have found no reference to further works by Joseph Backler. He just seems to have ground to a halt, and how he occupied his later years, in an artistic sense, until his death in 1848 remains a mystery. However, any number of misfortunes were to befall him, including his separation from his wife, the bankruptcy of his brother Samuel Backler, and the death sentence, commuted to transportation, on his son Joseph.